Returning from Nikko Anne and I enjoyed our last night in Tokyo before heading off to see the sights and visit friends in Osaka. Early the next day we boarded the "Bullet Train" for our journey to Osaka. As we traveled the 300 miles from Tokyo to Osaka we enjoyed the Japanese scenery from our speeding train. I guess you might say the highlights of the short trip was a view of the impressive Mt. Fuji and the snow. As we approached Osaka we slowed down because of heavy snowfall. To our surprise six to eight inches blanketed the ground. We would learn a bit later that it was surprising to everyone. Thankfully by the time we arrived in Osaka the weather had cleared. Arriving in Osaka we would meet Kako, a friend who lived near us in New Jersey for many years before returning to Japan. Over the years we've kept in touch and visited them once when they were in England. They are good friends and we looked forward to spending some time with them. When we arrived Kako was waiting with a big smile and hug for us both. Little did we know that she had an entire day of sightseeing planned for us before returning to her home later that night. We stowed our bags in her car and off we went sightseeing the sights of Kyoto and Osaka. 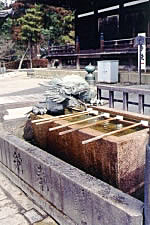 In Kyoto our first stop would be at Sanjusangendo Hall, the popular name for Rengeoln Temple. Built in 1164 by Emperor Goshirakawa who was a devotee of Kannon-Bodhisattva. The thousand-handed Kannon was believed to have saved mankind by disguising himself into 33 different figures, and the name Sanjusangendo means "hall with 33 bays." Inside are housed 1,001 golden images of Kannon (sorry, pictures were not allowed inside). The original temple burned down in 1249 A.D. and another of the same style was erected in 1269. This is the building that we see today in the picture to the left. 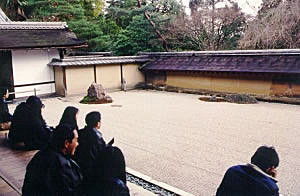 The grounds are manicured into an impressive garden area. Leaving Sanjusangendo Temple we walked toward our next objective, Kiyomizu Temple. Walking the streets we were impressed at how clean everything was and how much pride the Japanese put into manicuring their property. There seemed to be beautiful Japanese gardens everywhere, and we enjoyed seeing them. 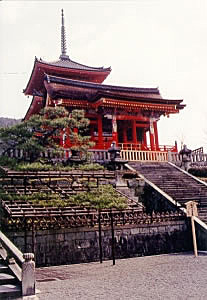 Kiyomizu Temple, originally constructed in 798, was rebuilt in 1633 by Iemitsu, the 3rd Tokugawa shogun. Perched on the side of a hill, the main hall is supported by 139 pillars, each 49 feet high, and offers a commanding view of the city below. Unfortunately visiting in the middle of February as we did doesn't offer the most beautiful of views as the trees are barren. Postcards were available showing the Main Hall exactly as shown here but with the trees in full bloom (red). It was beautiful. (Note: When I visit areas out of season, like this, I also purchase postcards to include in my albums showing it in a more beautiful setting or surrounding. However, since I did not take the picture and do not own the copyright to it I cannot use them on my web pages. 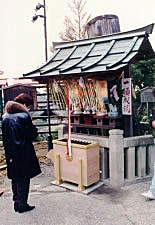 A word about temples: Japan is a country of temples and, as a result, they form an important part of the tourist's scheduled. Obviously they vary in size, importance and content, so it is impossible to fully describe what they are like in a few short words. 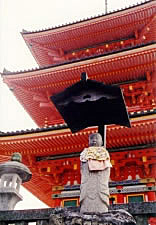 But, to give you a better understanding of what Japanese temples are like to a visitor I offer the following: Temples are complexes that often consist of more than one building or structure. They are a collection of buildings and structures located on a common ground. 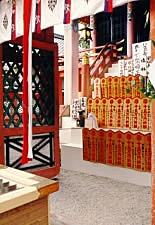 Inside you might find various smaller structures or temples devoted to a variety of different things where the faithful come to pray. They also vary in decoration. Some are elaborately decorated and painted in bright colors while others appear to be unpainted wooden structures. 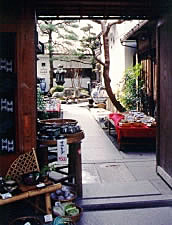 Japan today is like any other modern world capital, a mixture of various building styles from the ancient temples to the modern skyscrapers and malls. The Japanese today, for the majority, dress in western attire and not the traditional Japanese dress we are so accustomed to seeing on TV. 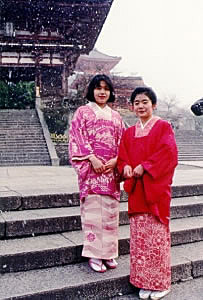 Entering Kiyomizu Temple Kako spotted these two young Japanese women dressed in the traditional kimonos and, before I knew what happened, she talked them into letting me take their picture. It would be the only photo I took of young girls wearing the brightly colored traditional kimonos. Leaving Kiyomizu Temple we headed to Rokuon-Ji Temple, or what is commonly called Kinkaku-ji, Temple of the Golden Pavillion. It was originally the villa of Kintsune Saionji, 1220 A.D. Yoshimitsu, the 3rd Shogun of Ashikaga, began to build Kitayamaden in 1397 making Kinkaku the centerpiece of his complex. Following his death Kinkaku was made into a Zen temple and all of the buildings except Kinkaku came to ruin. The gardens were maintained and, today, they are as they were hundreds of years ago. Unfortunately the original building was destroyed by fire in 1950 and the building we see today was erected in 1955. 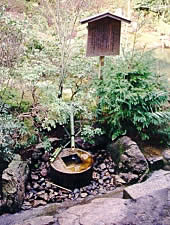 Kinkaku is set on the edge of a small pond, Kyoko-chi or mirror pond, and surrounded by immaculate gardens. 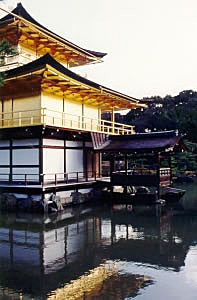 The main building, The Golden Pavillion, consists of three different styles of architecture. 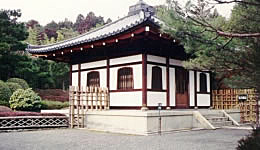 The first-story was built in palace style, Shinden-zukuri, and is named Ho-sui-in. 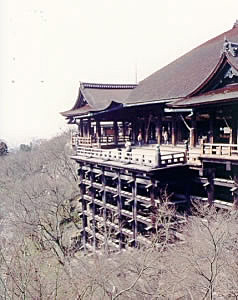 The second floor, named Cho-on-do, is built in the style of a samurai house, and the third-story is in the Zen temple, or Karayo, style. 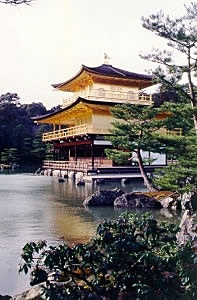 The second and third stories are covered in gold leaf over Japanese lacquer and the roof is thatched with shingles. Extensive repairs were undertaken and finished in 1987 to bring the building back to its original splendor. 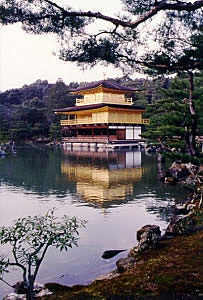 The present gold leaf is five times thicker than the original. Leaving the Golden Pavillion we headed toward Ryoanji Temple, which houses the most famous Zen rock garden in all of Japan. 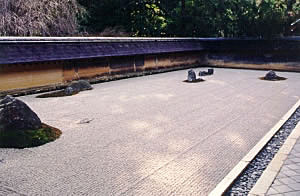 The rock garden consists of 15 rocks surrounded by raked white pebbles and is enclosed on three sides by a wall and, on the fourth side, by a wooden veranda where people sit and enjoy the garden. 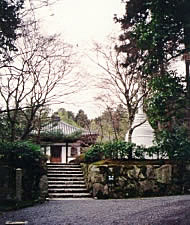 To me Ryoanji Temple is symbolic of and represents my impression of the Japanese people. The Japanese appear to be a spiritual people, deeply rooted to their history and culture. Here they come to reflect and meditate on whatever might be important to them at the time. Meant to be a quiet spot for meditation and reflection it is not as quiet as you might expect being located in a city. The rock garden is surrounded by a 1,000 year old pond and beautiful garden grounds.